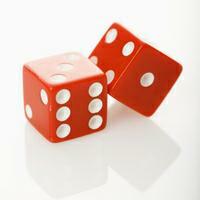 What's Luck Got to Do With Selling Houses in Baltimore, MD? Not long ago I talked with Ylan Q Mui, a staff writer at the Washington Post, who was writing an article on the things sellers do to help sell their houses. She wasn't interested in decluttering or staging. What she wanted to talk about was lucky charms, totems, and other magical devices. "It sold within a week. Rome tried it again with her second listing, and it sold within two weeks. She did it again for her third listing, and it also got snapped up. "I said, 'There's something to this,' she recalled. "Rome has since used the number for every property, though she now drives a convertible Lexus. ("I didn't want to jinx it," she said.) 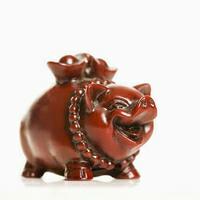 Only once did she stray, when a family instead asked to use a number that is auspicious in Asian traditions, an eight. So Rome priced the house to end in '988.' Luckily, she said, it sold." 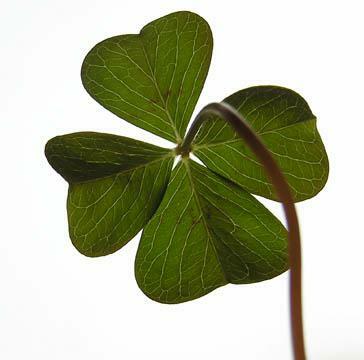 The thing is, I believe luck really has very little to do with selling houses. I believe it's much more the total of how you become known in your community, how you build your referrals over time, and how you treat people. As the saying goes, "The harder I work, the luckier I get!" This story was picked up and ran on the front page of The Baltimore Sun's Real Estate section. Two calls from friends who read it in the Boston Globe. How's your luck these days? Jason Crouch, one of the most admired and adored ActiveRainers, took time from his busy schedule to write the following review. Subscribing to Jason's blog is a must! Not too long ago, while speaking with my friend Margaret Rome, award-winning Baltimore Realtor, I asked how I could get a copy of her book, "Real Estate the Rome Way". She replied, "You give me your address and I will get it sent out to you soon." This book is an easy and fun read, with plenty of real life anecdotes to punctuate her ideas. You can learn more about Margaret's use of a signature color (brown), price (all of her listings end in 944), and even a particular candy that helps to make her marketing message more memorable (hint: there are a lot of "m"s in that last sentence). 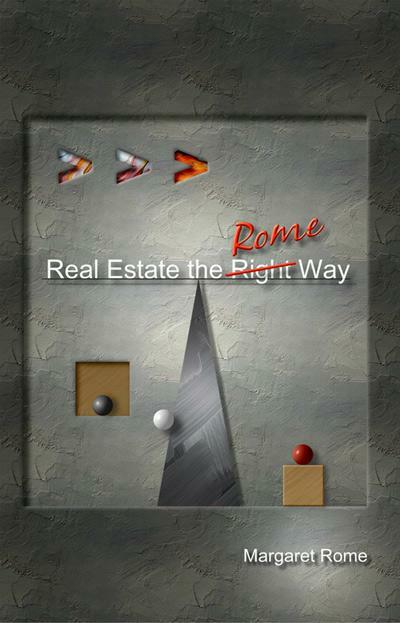 In a brisk, easy-to-understand fashion, "Real Estate the Rome Way" covers all of the basics, so it's definitely suitable for beginning agents who are trying to evaluate real estate as a career choice. However, she doesn't stop there, as I found some pertinent reminders for myself as a broker/owner, and I have been an agent for almost 13 years. Since I am a pretty prolific blogger, Margaret inspired me in another way. She and her friend Peg Silloway formed Silloway Press in order to get the book published. I am working on a book project (or two) myself, so holding Margaret's book in my hand made my own goal seem more attainable. In fact, I have wanted to be a published author since I was a kid. I plan to make this happen, and hopefully soon. This book is a must-read if you are just getting started in this challenging business. The perspective from a top-producing agent will also help if you are established and looking for new ideas. I recommend picking up a copy for yourself. EDITED: I corresponded with Margaret after writing this review, and she is offering FREE shipping and an autographed copy if you order the book directly from her. Email her at mrome@homerome.com and get yours today! "The Perfect Crab Cake" is something many restaurants in Maryland claim, but there's one place we've found that can back that claim with delicious proof. Not long ago we spent a delightful afternoon visiting friends in Belair and decided to top it off with a stop at a local favorite. When you pull in to a neighborhood strip shopping center at 5:00 p.m. on a Tuesday, and the place is packed, you just know it's going to be good. 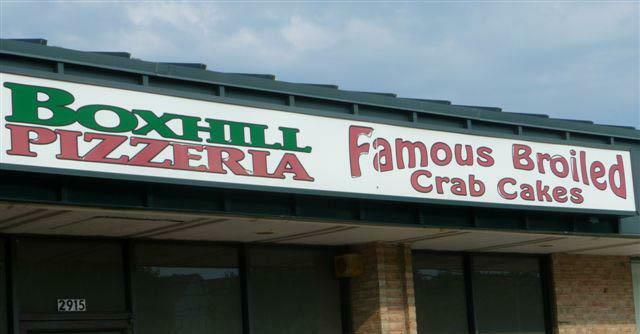 The Box Hill Pizzeria is known for its pizza, of course, but it's the crab cakes that bring people back. 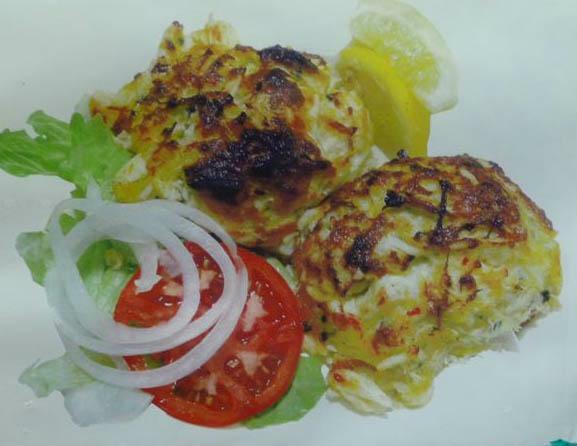 They were perfection, lumps of backfin crab (the best and sweetest crabmeat there is), seasoned and broiled to perfection, served up plump in generous portions. 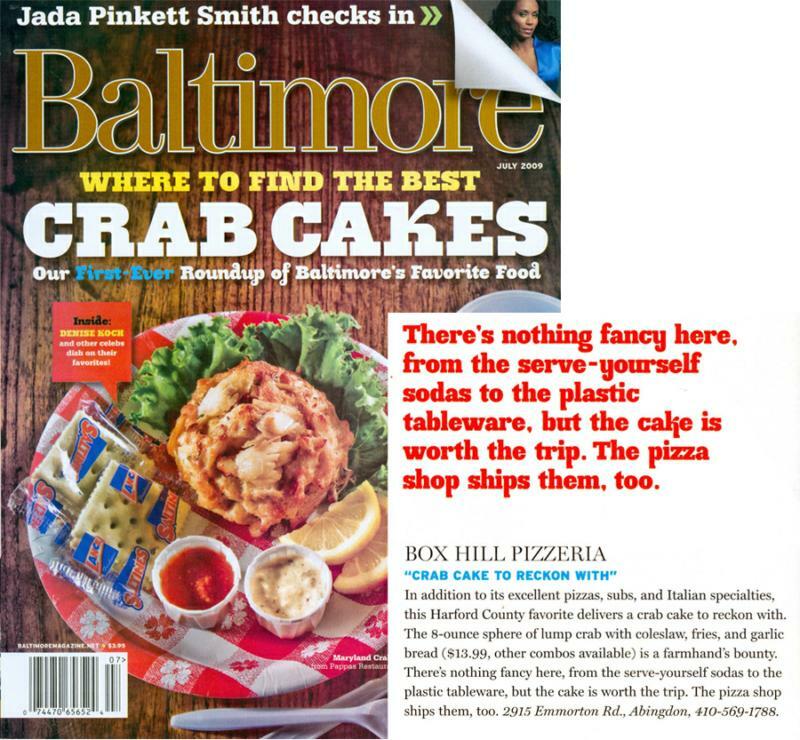 Box Hill's crab cakes were just picked among the best by Baltimore Magazine in the July 2009 issue. Yummy! bread and the pizza crust in the dressing!" Yes…it was delicious. It's true, you don't have to go far to have a vacation day in and near Baltimore. And when it's perfection in Maryland's signature dish, backfin crab cakes, Belair is just a short drive. Can't wait? 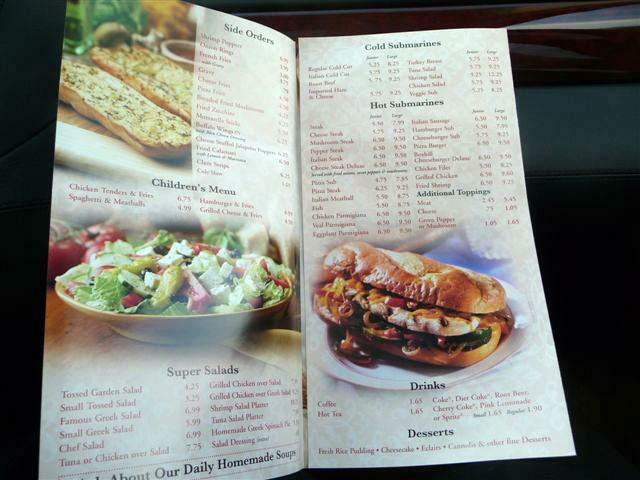 You can order online and taste perfection for yourself! When you live in Baltimore, you are never far from so many different settings. They call this state "America in Miniature" for good reason – we have the sea shore at Ocean City, we have the largest estuary in the United States with the Chesapeake Bay, we have flat farmland on the Eastern Shore, and the mountains of the Appalachians in the west. 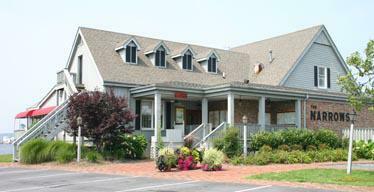 Not long ago we took advantage of the possibilities by driving over to Kent Island for lunch. The Bay Bridge from a moving car. 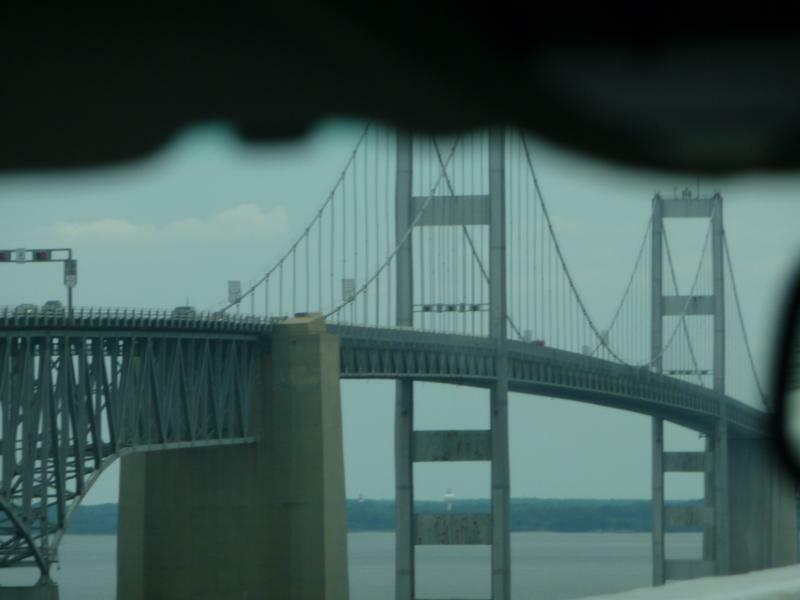 When you cross the Chesapeake Bay Bridge you also cross from the hustle-bustle of Baltimore and Washington, DC, to a slower and quieter way of life. Kent Island is at the other end of the bridge and a world away. 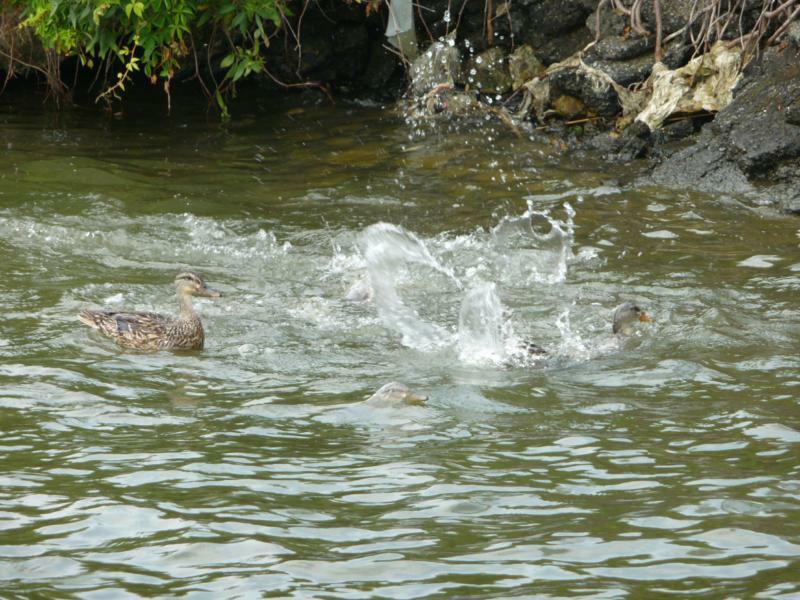 Here you can stroll along the water watching the splashing ducks and look at the perched bird. You can slow down and enjoy the brilliant flowers, and then settle in for a delicious lunch at a place we enjoy, The Narrows. 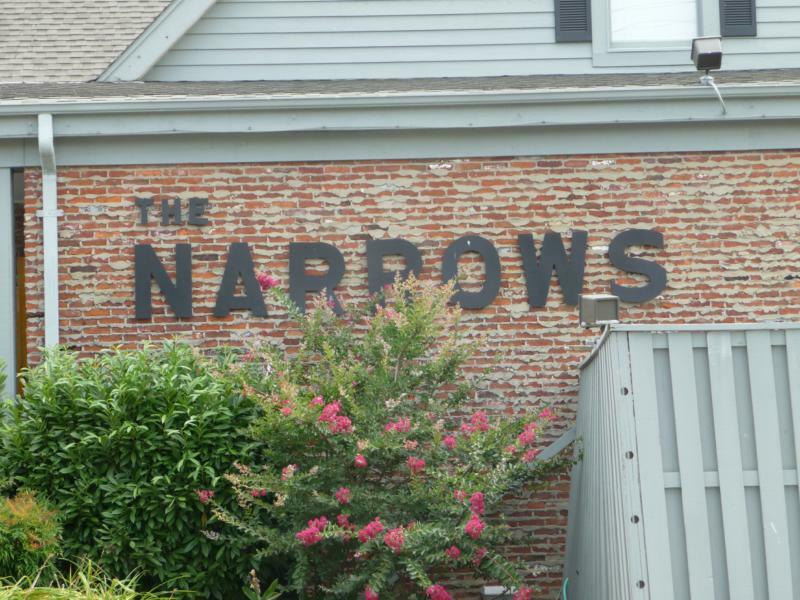 Named for the narrow waterway that separates Kent Island from the rest of the Eastern Shore, The Narrows is close enough for a lunch-time jaunt, but still has that on-vacation feel. The crab cakes and cream of crab soup with a splash of sherry is a favorite of many summer diners. 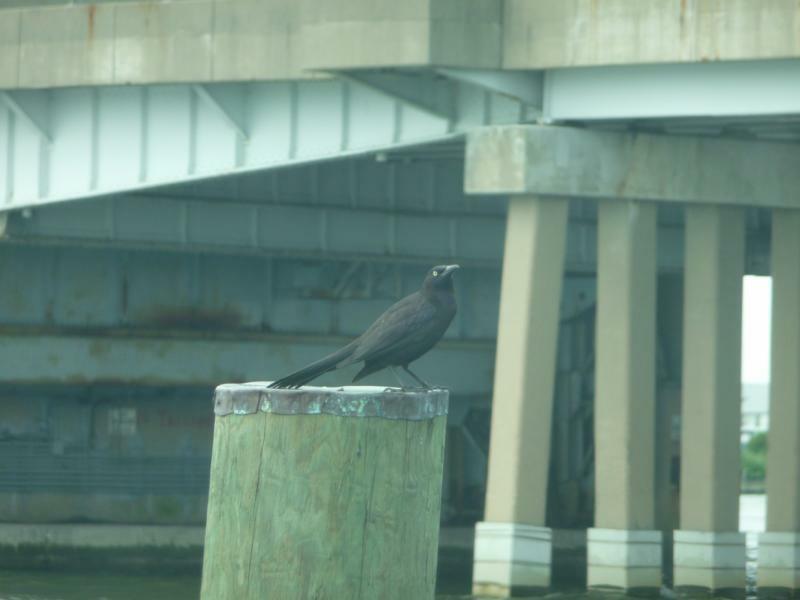 That's what I enjoy – a mini-getaway at Kent Island, Maryland. Gary Sisson is a Floyd Wickman trainer and one of my mentors. We met early in my career after I took the Sweathogs program, and have stayed good friends throughout the years. Gary called to say he was on his way to New Jersey visiting family, and would be coming through Baltimore on his way back home to North Carolina. We made plans to have lunch on his way home. 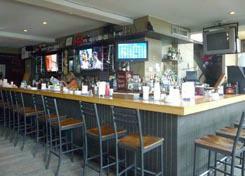 Lee and I would meet them at a favorite restaurant, the Bay Café in Baltimore,Maryland. It was a perfect day for us to have lunch at the Bay Café with Gary, his wife Lauren, and their lovely daughter, Olivia. The bar and restaurant has multiple levels, but we took a table outside and right on the water. 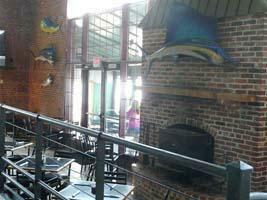 Bay Café is also known as Baltimore's Best Beach and with good reason. 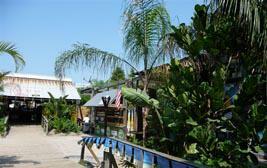 When you walk from the parking lot it feels as if you've been transported to the tropics! 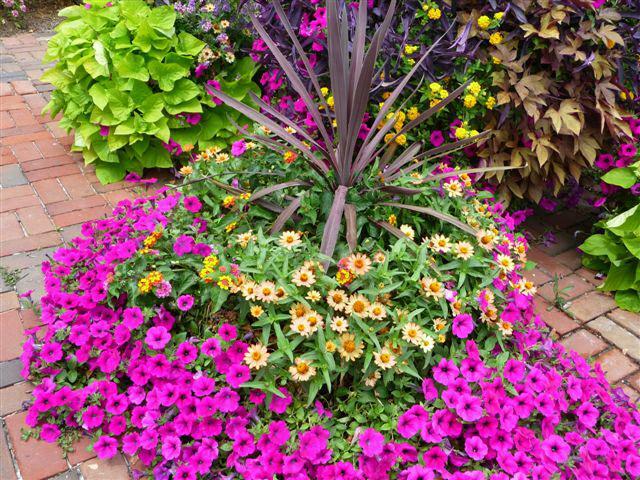 Look how they have made this feel like an island beach with gorgeous plants, lots of palms and flowering hibiscus. 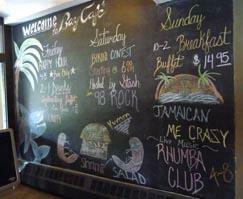 Even the chalkboard of special events had a tropical feel, thanks to a couple of talented artists who work at the Café. It was so pleasant sitting by the water, with good friends and good food. 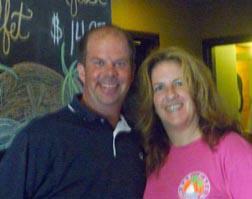 We enjoyed the superb shrimp salad, crab cakes, pizza and curly fries. 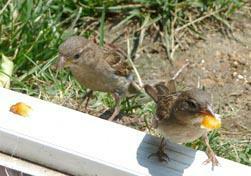 In fact, we got so wrapped up in our conversation and feeding the birds that I forgot to photograph the food! 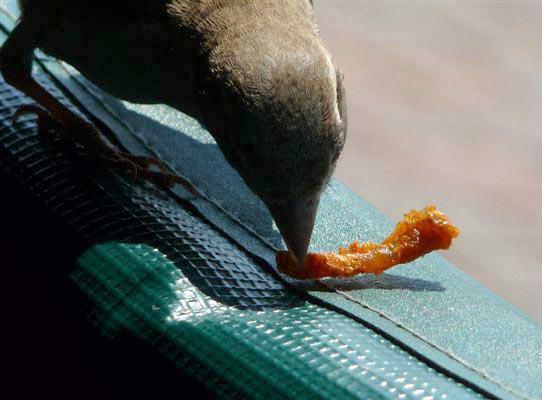 But we have proof that the birds enjoyed the fries. What else would you want for paradise but good friends, good food, and good conversation? A Waiting List for Clients! Saturday Morning's Teleseminar Was a Hit! It was a lively discussion on Saturday morning when Jennifer Allan hosted a teleseminar on Alternative Business Modelswith Nishika Jones, Mollie Wasserman, and me. First up was Nishika who spoke from the perspective of a young mother. She aims for volume, working in HUD homes and using Facebook, Craig's list, and her SOI (sphere of influence) to get more leads, working a referral business, and generating income by doing more deals. Then it was my turn to talk about how I use a waiting list. 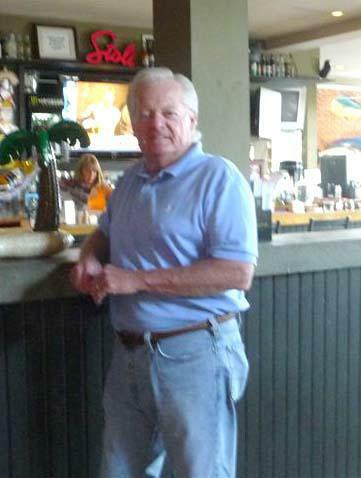 After almost 20 years in real estate, my business is about 99% referral, and restricted to fifteen listings at any time. If someone wants to list with me and I don't have room, they can go onto my waiting list. 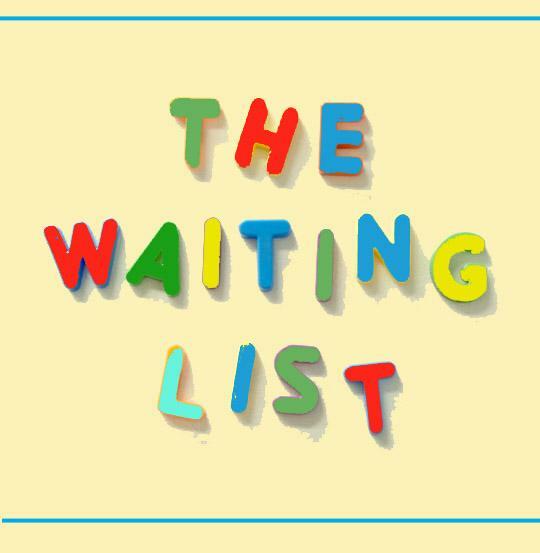 The waiting list is something that started early on when there were people I really wanted to work with and some I didn't want to work with. For them, I used to say, "I have a waiting list," figuring they would say, "Forget it!" and go somewhere else. But I found that some sellers were impressed that I was able to turn down a listing, and often they would actually wait to work with me. 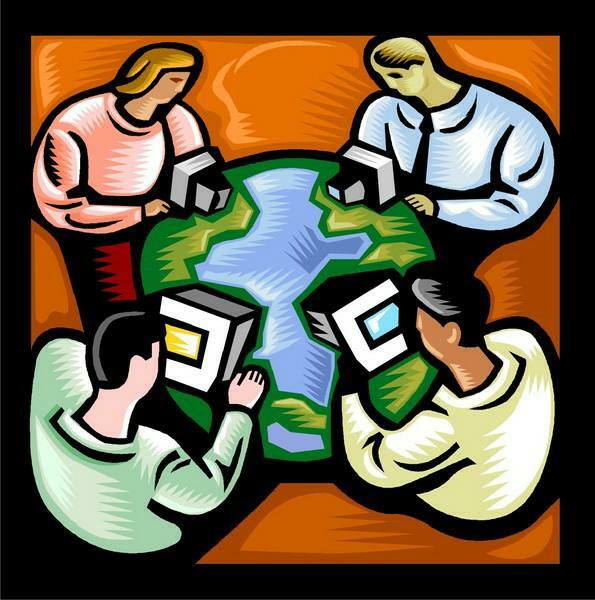 One important point is that I am essentially a listing agent and work with very few buyers. I make all my appointments and no one talks to my sellers but me. I aim for fewer transactions and making a higher commission on the ones I do. Jennifer had mentioned in her introduction that I get a high commission rate, and she's right. When the commission question comes up, I tell people that I can almost promise them that I will have the highest commission rate. But since just about all my clients come by referral, they already know how I work. After I spoke for a few minutes we started on the many questions that were coming in. One interesting question was how a new agent can adapt this model and use a waiting list for their situation. My advice is to not rush out to take a listing as soon as someone calls. Take the time to get information in advance. Ask how many agents they are interviewing, and try to be the last they talk to. Even say something like, "I have room for one more listing this week." Even if you don't have any listings, that's a true statement, but keeps you from looking too eager or desperate. And this is important: Always be ready to walk away from a listing. Don't do business with people you don't like or trust, even if you are struggling and needing every listing you can get. If you don't trust them going in, that's a pretty good indication that the listing will cost you more in time, aggravation, and money than you will make. 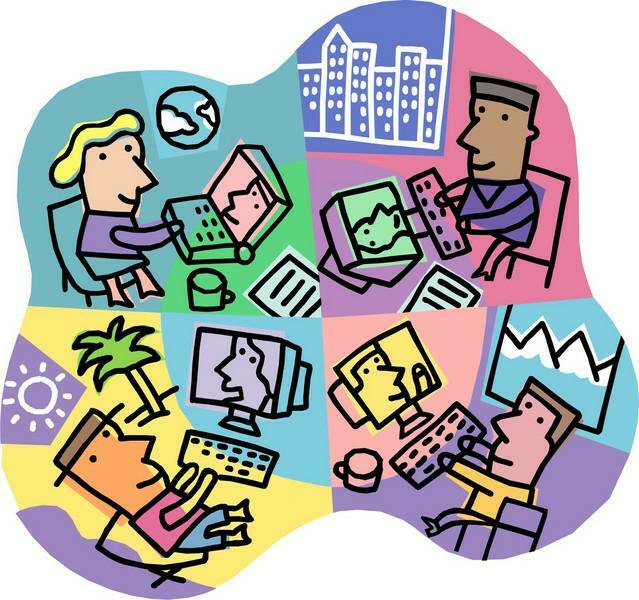 Don't think of it as turning down a listing; think of it as making room for a better listing. There were many more questions than we had time for, but we had to move on since Mollie and Jennifer still had to speak. Mollie spoke third about ACRE®. By now you all know how I feel about Mollie and my ACRE designation. Having the option of acting as a consultant gives you another way of offering services and being compensated for your time. Anything that helps me give that extra level of service is valuable. And Jennifer, our leader, discussed the Big Bad “D” word - discount brokerage. It's a subject that generates hostility from other agents, and she found that some companies even refused to show homes listed with her. 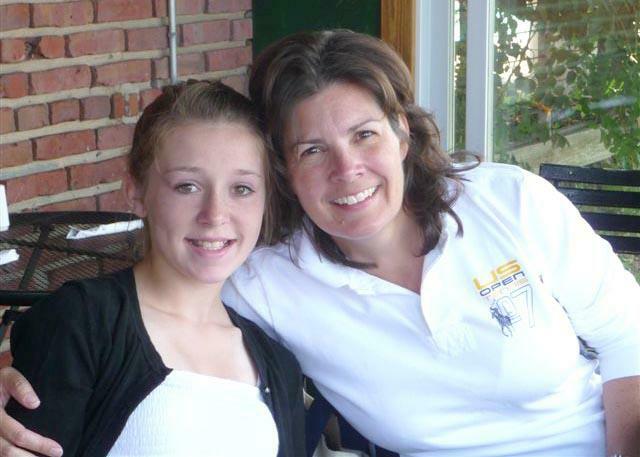 Jennifer said she was an owner of a discount brokerage which offered a full service. 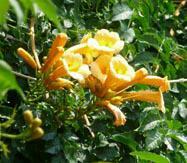 Her aim was to do a large volume, and though she did not market herself, she always mentioned her fee/charge. Jennifer feels that to make a discount work, you need to be your own broker - in other words, not having to share. The pie can be split, but not too much, if you want a decent size slice. We each spoke for about 10 minutes and then took questions. Seminar attendees were able to “ask” questions by writing in a box on line that Jennifer could see. Kind of like Stumping Broker Bryant...It Didn't Happen! Wrapping it up, each of us is giving away a prize. The deal was that each of us would choose a number between 1 and 1,000, and whoever guessed closest to our number would receive a gift. Mollie is giving a copy of her book, Ripping the Roof Off Real Estate. Jennifer is giving a review copy of her new book, Sell with Soul – The Second Edition. Nishika is giving a copy of her book, How to Make Money with HUD Homes plus a free half hour of her time via telephone. I liked Nishika's idea so I am giving a copy of my book, Real Estate the Rome Way, and a half hour of my time. There were loads of emails. My number was 944 and those who read my ActiveRain blog or my book will understand what “944” means. Instead of just one, I picked three winners! Melanie Sedalnick was the closest with a guess of 932 and wins a signed copy of my book and ½ hour phone consultation. Paula Bean at 999 was second and also wins a signed copy and ½ hour phone consultation. Oh heck, Walt Anderson at 825 was the third closest and will also receive the book and the ½ hour phone consultation. We had a lot of fun with this teleseminar. Thanks to everyone who tuned in, thanks to Mollie and Nishika, and especially to Jennifer for pulling it all together so beautifully!